I saw this book on a friend's GoodReads list and decided that since I like Chesterton I'd give it a try. As a bonus, since Chesterton's works are in the public domain, I was able to get the book free of charge (and you can too!). So there really is no excuse for not cozying up with a little G. K. Chesterton. To add to my bonus, I scored an audiobook from LibriVox. If you are not familiar with LibriVox, you can go to their website. In short, people volunteer to record books in the public domain and distribute them. You can actually subscribe to a book in your favorite podcast app and listen to it that way! NOTE: While this is not a review of LibriVox, and beggars really can't be choosers, but note that when you subscribe to a LibriVox audiobook you are at the mercy of the readers who volunteered. Some readers are top notch. Some should be encouraged to volunteer to do other things. Some need better equipment if they plan to continue doing this type of work. Enough on this. Overall it's a great service you should totally look into! G. K. Chesterton was bold, brash and british. He writes with the dry wit one commonly associates with his type. As a result, it takes some time to acclimate to his prose if you are completely unfamiliar with his writing. But once you get used to it, there are many gems embedded in his writings. The premise of The Flying Inn is that the English government is slowly being infiltrated by a group of Muslim extremists while in the process of enforcing the Temperance Movement. Inns (pubs/taverns) can only sell alcohol if they retain their sign as an inn, something that law enforcement has been restricting. Enter Humphrey Pump, hero of the story. Pump is an innkeeper who owns and operates The Old Ship. After a scuffle with Lord Ivywood, Pump and Captain Patrick Dalroy grab their sign, rum and cheese and canvas the countryside serving liquor under their traveling sign. The pair effectively executes their subversion by finding other such loopholes throughout the story as the law becomes more and more restrictive. Chesterton cleverly uses this backdrop to present a critique on Christianity more so than Islam. While the heroes are struggling with the Muslim impetus for temperance, Chesterton offers a blazing critique on Christian ascetics who would prohibit the sale and consumption of alcohol and meat (forced vegetarianism is also covered in this book). This is an interesting book in that it anticipates a world where extremists may successfully take over a major metropolitan area and use their sectarian views as the basis for their governance. 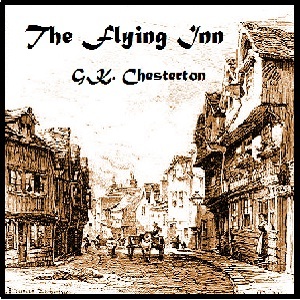 Chesterton was not contending with Isis when writing The Flying Inn. Though fanciful, it is an interesting mental exercise and reinforces the positive aspects of the separation of Church and State.